Airdyne Aerospace Inc. | US to boost nuke sniffing with modified C-130s - Airdyne Aerospace Inc.
WASHINGTON — When the Air Force dispatches aircraft to the Asia-Pacific to monitor the atmosphere for signs of nuclear activity from North Korea, it relies on its WC-135 Constant Phoenix nuke-sniffing planes. But with only two of those in the service’s inventory, it’s possible the WC-135s might not be able to respond to every contingency. Enter the ever-versatile C-130 Hercules, which now can be equipped with a modular kit that allows it to detect nuclear particles in the atmosphere. The Air Force spent $10.1 million in fiscal year 2016 for two “Harvester Particulate Airborne Collection System” kits that can be strapped onto C-130H/Js and collect microscopic nuclear solids in the event that the service can’t make its WC-135 aircraft available, said Susan Romano, a spokeswoman for the Air Force Technical Applications Center (AFTAC), which is responsible for conducting nuclear surveillance for the Defense Department. Air Force Chief of Staff Gen. Dave Goldfein has said that the current WC-135 planes are too old and too few in number to meet all of the Defense Department’s demands. “Our mission capable rates, and more importantly our aircraft availability rates to go do this mission, are much lower than not only the secretary of defense but the combatant commander’s requirements for that mission,” he told Congress in April. While the Harvester kits won’t give the C-130 the full capability of the Constant Phoenix, it gives the U.S. Air Force a needed boost in capacity at a time when its more focused than ever on the nuclear activities of Russia, North Korea, China and Iran. Defense News first learned about these specially-outfitted Hercules thanks to a series of tweets by Quinton McGuire, a former C-130 loadmaster who participated in 2015 tests of the Harvester system aboard a Super Hercules flying out of Hurlburt Field, Florida. McGuire’s photos show a C-130J with the rear paratrooper doors outfitted with a podded sensor hanging from the exterior of the door. During the demonstration, a WC-135 crew operated the sensor pod and conducted onboard analysis, McGuire said in a series of tweets. Also present during the flight were representatives from Sandia National Laboratory, one of the nation’s largest research labs for nuclear weaponry, which developed the Harvester pods. The Harvester kit was also tested on Customs and Border Protection MQ-9 Reaper drones before technical demonstrations wrapped up in 2015, Romano said. Since then, the Air Force decided to procure two kits, which are currently going through the acceptance process and will fully operational and mission-ready in fiscal year 2019. Each Harvester suite includes two sampling pods that collect radioactive particles and a gamma radiation sensor that helps guide the aircraft to a radioactive plume, according to a Sandia news release on a 2013 test aboard an MQ-9. It also includes radiation protection gear and other equipment needed to sample and analyze nuclear particles in air and on the ground, Romano said. During a mission, Air Mobility Command would provide C-130s and the pilots and crew needed to operate the aircraft itself, while the 21st Surveillance Squadron would provide the personnel needed to use the Harvester equipment and do the nuclear forensics onboard. The C-130 would first use the gamma radiation sensor to find a hot spot of nuclear activity, and then flying through the plume, passing air rapidly through the sampling pod. That action rams microscopic nuclear particles into the filter paper in the pods much the way that a vaccum uses a filter to collect dirt. So if nuclear particles can be detected by a C-130, why does the Air Force still need the WC-135? 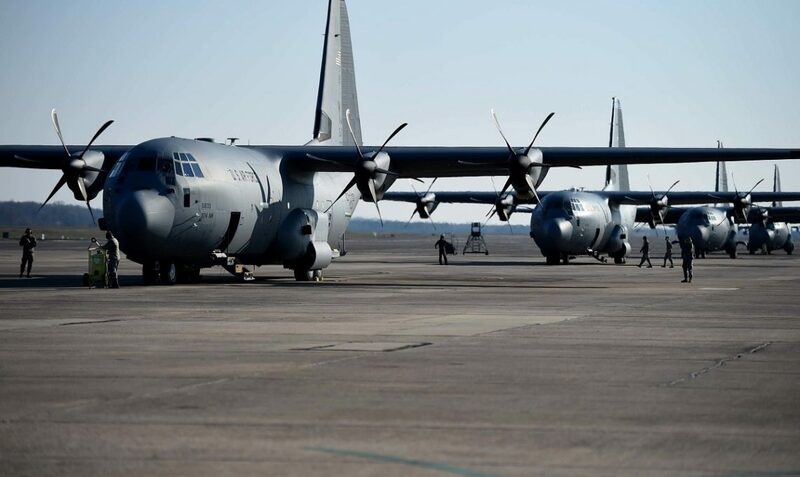 A “rapid, medium altitude, manned, refuel-capable aircraft” is currently required to do the nuclear treaty monitoring mission, said Romano, and the C-130 doesn’t fit the bill. For one, it can’t refuel other aircraft. But even more importantly, the modular Harvester kits only give the C-130 the ability to collect particles, while the WC-135 has a collection system for nuclear gases, as well as other equipment like internal filtration that allows the crews to conduct longer missions, Romano said. Additionally, the C-130 flies slow and low. While the C-130J may be able to hit a higher top speed than a WC-135, its 28,000-foot ceiling is significantly lower than the WC-135’s 40,000-foot maximum altitude, according to Air Force fact sheets. Meanwhile, the WC-135 outperforms the C-130H variant in both areas. Although the nuclear treaty monitoring mission isn’t often discussed by the Air Force due for classification reasons, it’s clear that the service is putting more money into ensuring that it can rapidly respond when an adversary tests nuclear weapons. In September 2019, L3 Technologies will begin transforming three KC-135R tankers into WC-135s. Those three new Constant Phoenix planes will allow the Air Force to retire its current two WC-135s — and increase the number of nuke sniffers by one aircraft. The Air Force is requesting $208 million in FY19 for the Constant Phoenix upgrade effort, with an additional $8 million planned in FY20.